The Nisco Encapsulator provides you with immobilization of living cells within hydrogel beads in small managed quantities. 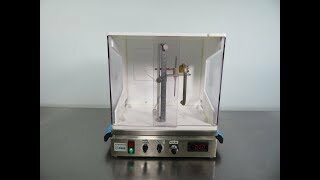 This bead generator uses electrostatic force to pull droplets into a gelling bath to produce spherical alginate beads with a size range of between 200-2400 μm. This encapsulator has analog controls at the front that allow users to fine tune voltage, as well as control the pump and magnetic agitator that helps to keep the beads separated. By using different sized needles with this bead generator this instrument can produce between 2400 to 24,000 capsules/minute. This Nisco Encapsulator has been fully inspected and is performing to expectations. All of our lab equipment comes backed with our standard warranty. Should you have any questions, pleaes don't hesitate to contact us.